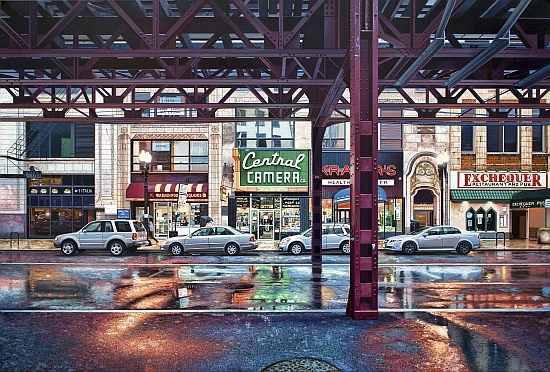 Nathan Walsh -- a realist painter who lives and works in York, England -- initiates his views of American cities with a single postcard-sized study which he then enlarges into a rigorous blueprint-like underdrawing. As he layers and builds his paintings Walsh subtly alters and enhances the perspective of each scene: he feels that artifice is necessary to make his works convincing. 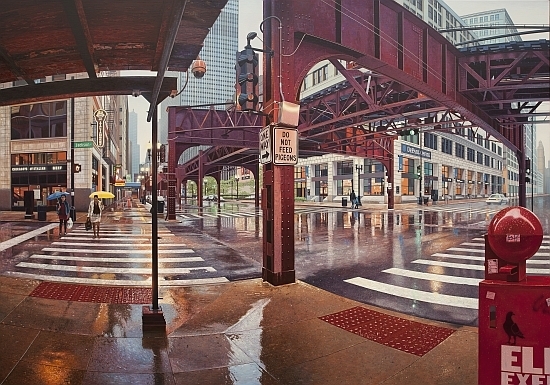 Although he does use photographs as one of his source materials, Walsh does not define himself as a Photorealist. "You almost need to create the space from scratch, using the photographs only as a guide," he explains: "If you don't do that it won't be convincing as a painting." 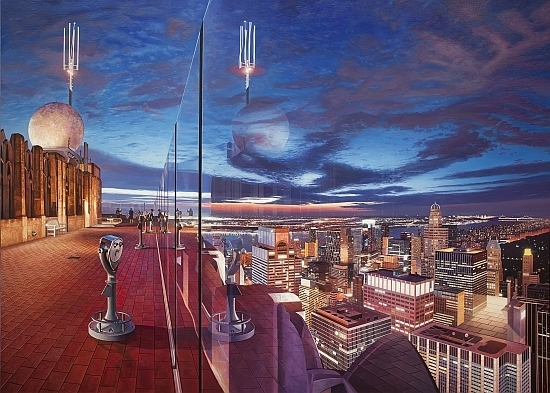 Visitors to his upcoming exhibition at Bernarducci Meisel Gallery will be able to use a newly developed iphone app called "Repentir" to "rewind" the developmental and artistic processes behind Nathan's painting Transamerica by taking a photo of the canvas and then scrolling or wiping away its layers. 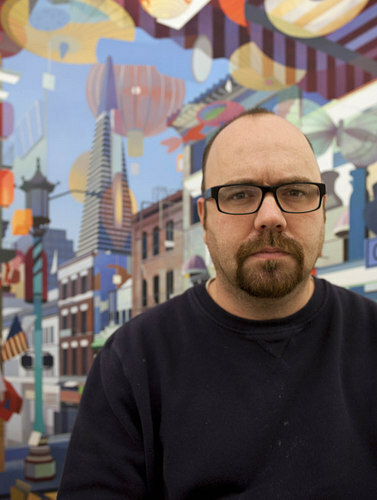 I recently spoke to Nathan about his work, his artistic process and his subject matter. I can remember as a child looking at reproductions of Van Gogh drawings that my father had framed up around our house. This must have piqued my interest and I enjoyed drawing and painting at school which led to completing an arts foundation course, then a degree in Graphics Arts at Liverpool. Liverpool had a rich visual art scene and was an exciting place to study and explore. More than anything I remember doing lots of reportage and life drawing, I had little idea of how I might apply this practice but I was keen to study and improve it. I continued making drawings and simple observational paintings for a number of years after university which led to being included into local and eventually national exhibitions. This in turn led being offered an associate lectureship at an art college in York, where I still live today. Teaching half the week and making paintings for the rest of it was a happy medium with one activity informing the other. Around my late twenties I began to feel that the work I was making lacked any real direction and I enrolled on a Masters program led at the time by two noted realist painters, Steve Whitehead and Clive Head. It was a small course but in a lot of ways could have been tailor made for me, and I served what now seems like a traditional artist's apprenticeship. Central Camera, 69.5 x 103cms., oil on linen, 2012 What did your early paintings look like? Like many artists my early work displays the heavy influence of whoever I was looking at at the time. I've moved through various phases, obsessions with Vuillard, Bonnard, Sargent, Whistler etc. 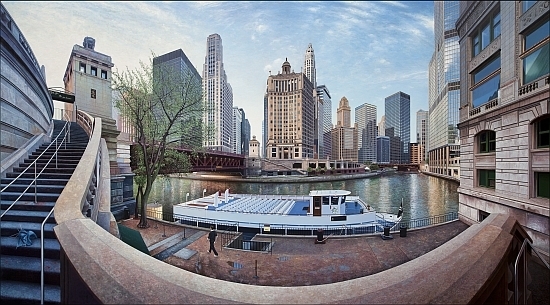 led to more contemporary realist practice, Estes, Rackstraw Downes, Neil Welliver and Lopez Garcia. There is a direct link with what I was doing fifteen years ago to what I'm doing now but my practice has become far more focused and less derivative. You once told an interviewer 'I suppose I am a bad Photorealist painter, but that's because I am not really a Photorealist painter'. Can you expand on that statement? I use photography in my work but only in a way to gather and manipulate information. The idea of duplicating something that already exists as photography is I believe now a redundant position. To this end my working habits go against standard photorealist methodology. For example I don't construct scenes digitally using software or mechanically transfer imagery from monitor or slide to canvas. It would be easy to do this but when a camera or computer starts to exclusively dictate how a painting looks then the outcome is predetermined. My paintings purposefully explore surface, colour, mark-making and texture all of which are absent from the source material. The confusion often lies when my work is viewed as a photographic reproduction whether that be in a catalogue or more frequently online. In your preparatory drawings you "create space from scratch." Tell me a bit more about that process? 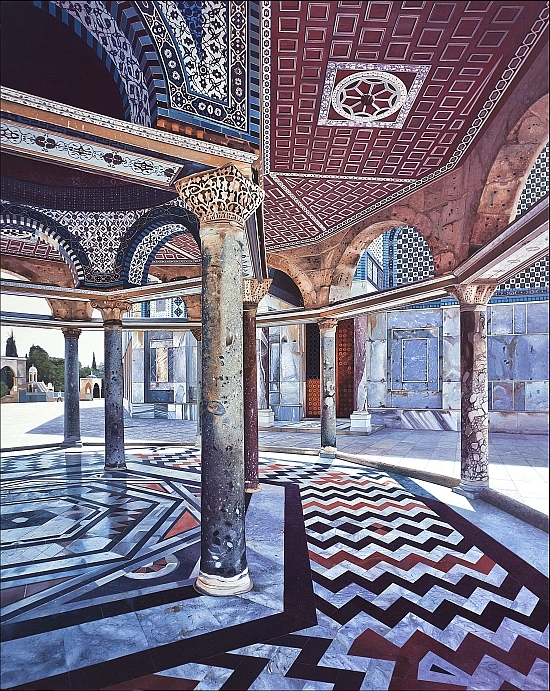 Photographs are by their nature flat and exclude the opportunity to explore the illusionistic space a painting can suggest. Therefore I draw and then redraw every element within my pictorial space linked to a series of vanishing points along a horizon line. I use perspective in a fluid and open ended way which will change and develop from painting to painting; again it's based on a conscious decision to move away from a 'known' way of describing the world. Working in this way allows me to alter to shape or size of a building, tree or person, change its position or remove it from the composition altogether. If I want mix curvilinear perspective with linear then I can or if the picture demands a position that lies in-between these positions then so be it. It's not a conventional approach but takes from various sources and becomes something of its own making. It also allows for the introduction of elements not present at the original location, whether that be 'importing' a structure from Google earth or drawing a real life object in my studio and incorporating it. This is a hybrid approach to drawing, the goal being to create space that is convincing and concrete. In this drawn and painted world it has to make sense on it owns terms, if an architect were to analyze my drawn buildings I'm sure they wouldn't stand up for long. Could you discuss one of your favorite images from your current show? 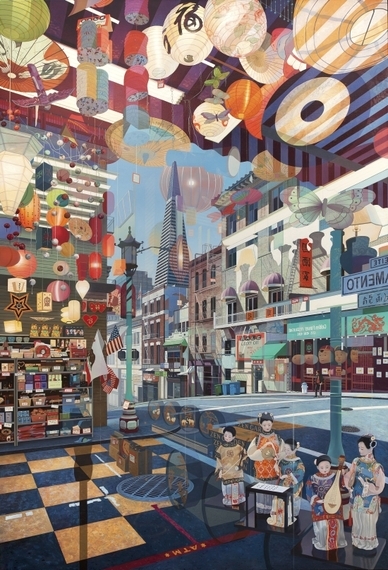 I think the most exciting paintings in the show are the ones which move furthest away from a conventional way of describing the world but still look believable as a world we could inhabit. 23 Skidoo is the most ambitious painting I've made to date; it describes three separate streets in the Flatiron district NYC and a multitude of people going about their daily business. You couldn't take in this view as a pedestrian or see around each street corner as I've visualized it. The time I spent on location presented an area of chaos and variety which led me to want to make something in response which was the opposite of this state. My painting is ordered, an obvious construct where each specific person is engaged in a definite activity which relates formally to the architecture around them. I guess in a roundabout way I'm looking to make an idealised version of the world around us. Is there anything else you would like to say about yourself or your art? I think my show that runs through November is very much a starting point. It suggests a number of points of departure which can be further explored or rejected. 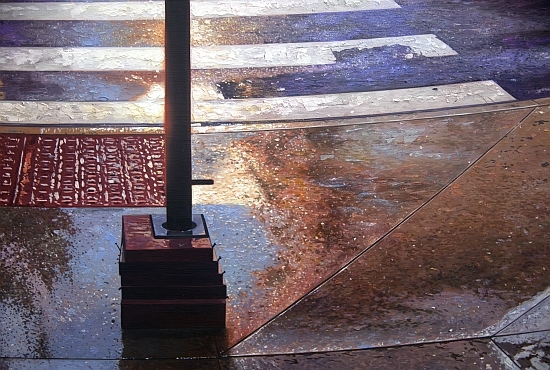 Realist painting is at an important stage in its development and has to keep moving forward if it's to remain valid. There are a number of artists both sides of the Atlantic who are acutely aware of this issue and are finding new ways of making alternate (painted) realities. The next five or so years are going to be very interesting and I hope to play a role in this movement.